In the Vulgate, each of these blessings begins with the word beati, which translates to "happy", "rich", or "blessed" (plural adjective). The corresponding word in the original Greek is μακάριοι (makarioi), with the same meanings. [a] Thus "Blessed are the poor in spirit" appears in Latin as beati pauperes spiritu. The Latin noun beātitūdō was coined by Cicero to describe a state of blessedness, and was later incorporated within the chapter headings written for Matthew 5 in various printed versions of the Vulgate. Subsequently, the word was anglicized to beatytudes in the Great Bible of 1540, and has, over time, taken on a preferred spelling of beatitudes. ¹²Rejoice and be glad, because great is your reward in heaven, for in the same way they persecuted the prophets who were before you. The ninth beatitude (Matthew 5:11–12) refers to the bearing of reviling and is addressed to the disciples. [page needed] R. T. France considers verses 11 and 12 to be based on Isaiah 51:7. The Beatitudes unique to Matthew are the meek, the merciful, the pure of heart, and the peacemakers. The other four have similar entries in Luke, but are followed almost immediately by "four woes". The term "poor in spirit" is unique to Matthew. The four Beatitudes in Luke 6:20–22 are set within the Sermon on the Plain. Luke 6:23 ("Rejoice in that day and leap for joy, because great is your reward in heaven. For that is how their ancestors treated the prophets.") appears to parallel the text in Matthew 5:11–12. These woes are distinct from the Seven Woes of the Pharisees which appear later in Luke 11:37–54. The term "the meek" would be familiar in the Old Testament, e.g., as in Psalm 37:11. Although the Beatitude concerning the meek has been much praised even by some non-Christians such as Mahatma Gandhi, some view the admonition to meekness skeptically. Friedrich Nietzsche in On the Genealogy of Morals considered the verse to be embodying what he perceived as a slave morality. The phrase "poor in spirit" (πτωχοὶ τῷ πνεύματι) in Matthew 5:3 has been subject to a variety of interpretations. A.W. Tozer describes poverty of spirit as "an inward state paralleling the outward circumstances of the common beggar in the streets." There are men who fear to call their souls their own, and if they did, they would deceive—themselves. At times such men baptize their cowardice in holy water, name it humility, and tremble. …They are not blessed. Their life is a creeping paralysis. Afraid to stand for their convictions, they end by having no convictions to stand to. Dallas Willard, most notably, in the fourth chapter of his "The Divine Conspiracy: Rediscovering Our Hidden Life in God" has proposed that the Beatitudes are not virtues or meritorious conditions. Rather, they are proclamations that the people before Jesus on the mountain are blessed (well off) because they are disciples of Jesus Christ. These proclamations are instructive in that they communicate to the hearers that many who are in a deplorable condition are blessed in spite of this because the kingdom of heaven has been opened even to them by Jesus Christ. Alfred Edersheim held a similar (or identical) view. He is quoted by Willard as saying: "It is not because a man is poor in spirit that his is the Kingdom of Heaven, in the sense that one state will grow into the other, or be its result; still less is the one the reward of the other. The connecting link is in each case Christ Himself: because He… "has opened the Kingdom of Heaven to all believers." This interpretation relies on a view of Jesus' main message being the availability of the Kingdom of Heaven (see Mt 4:17). The Beatitudes then, are, according to Willard, "…proof that, in [Jesus], the rule of God from the heavens truly is available in life circumstances that are beyond all human hope." 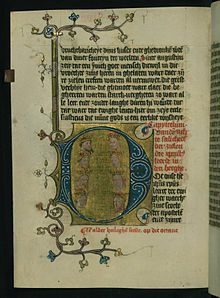 This interpretation sees the Beatitudes as continuing a biblical theme of status inversion in such places as the "Song of Moses and Miriam" in Exodus 15, the prayer of Hannah in 1 Samuel 2, the story of David and Goliath in 1 Samuel 17, Jehoshaphat's prayer and battle in 2 Chronicles 20, and the "Magnificat" of the Virgin Mary in Luke 1. Also: Psalm 34, 37, and 107. Again, the inversion occurs, not because of a meritorious condition but in spite of it and by God's salvific initiative. ^ "[T]he name of "Makaria", the “blessed” or “prosperous” one— …as well as the family’s membership in the upper classes. ^ a b c Majerník, Ján; Ponessa, Joseph; Manhardt, Laurie Watson (2005). The Synoptics: Matthew, Mark, Luke. Steubenville, OH: Emmaus Road. pp. 63–68. ISBN 1-931018-31-6. ^ Roselli, David Kawalko (April 2007), "Gender, Class and Ideology: The Social Function of Virgin Sacrifice in Euripides' Children of Herakles", Classical Antiquity, University of California Press, 26 (1): 81–169 . ^ Liddell; Scott, Lexicon, Blessed, happy, fortunate; in Attic, one of the upper classes. ^ The Vulgate New Testament with the Douay Version of 1582 in Parallel Columns. p. 5. ^ Savage, Henry Edwin (1910). The Gospel of the Kingdom. p. 69. ^ Great Bible. 1540. p. 431. ^ a b c Aune, David Edward (2003). The Westminster Dictionary of New Testament and early Christian literature. pp. 75–78. ISBN 978-0-664-21917-8. ^ a b c d Beatitudes. Catholic Encyclopedia. Retrieved September 5, 2013. ^ Hunsinger, George (March 2016), The Beatitudes, Paulist Press . ^ Vost, Kevin (2006), The Nine Beatitudes, Memorize the Faith, NH: Sophia Institute Press, p. 553 . ^ France, R.T. (October 1987). The Gospel According to Matthew: an Introduction and Commentary (1 ed.). Leicester: Send the Light. ISBN 0-8028-0063-7. ^ a b Hastings, James (2004). Dictionary of the Bible: dealing with its language, literature, and contents, including the Biblical theology. Honolulu, Hawaii: University Press of the Pacific. pp. 15–19. ISBN 1-4102-1730-2. ^ Hill, David (June 1981). Gospel of Matthew. New Century Bible Commentary. Grand Rapids: Eerdmans. ISBN 0-8028-1886-2. ^ Nietzsche, Friedrich (1999) . On the Genealogy of Morals [Zur Genealogie der Moral] (PDF). USA: Oxford University Press. ISBN 978-0-19283617-5. ^ a b Jegen, Carol Frances (1986). Jesus the Peacemaker. Kansas City, MS: Sheed & Ward. pp. 68–71. ISBN 0-934134-36-7. ^ Torretto, Richard (2010). A Divine Mercy Resource. New York: iUniverse. pp. 53, 126. ISBN 1-4502-3236-1. ^ A.W. Tozer (1957), The Pursuit of God. ^ Ridges, David (2007). The Book of Mormon Made Easier, Part III. Springville, UT: Cedar Fort. pp. 148–49. ISBN 1-55517-787-5. ^ a b "Third Nephi, Chapter 12". The Book of Nephi. Church of Christ (Latter Day Saints). 3: 3. Retrieved September 5, 2013. 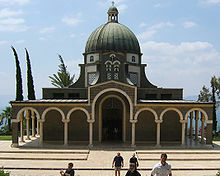 ^ Bahá’u’lláh (1988). Tablets of Bahá’u’lláh Revealed After the Kitáb-i-Aqdas (pocket-size ed.). US Bahá’í Publishing Trust. p. 269. Retrieved September 4, 2013. ^ Akhtar, Shabbir (December 19, 2007). The Quran and the Secular Mind. London, New York: Routledge. p. 380. ISBN 0-41543783-0. ^ a b Randall, Albert B. (2006). Strangers on the Shore: The Beatitudes in World Religions. pp. 41–44. ISBN 978-0-8204-8136-4. ^ Spiro, Melford E. (May 27, 1982). Buddhism and Society. p. 359. ISBN 0-52004672-2. ^ "Pope offers new Beatitudes for saints of a new age". Catholic news. 2016. Twomey, M.W. "The Beatitudes". A Dictionary of Biblical Tradition in English Literature. David Lyle Jeffrey, gen. ed. Grand Rapids: W.B. Eerdmans, 1992.